The following PROC SGPLOT statements produce the simple scatter plot of the ENSO data, displayed in Output 53.4.1. 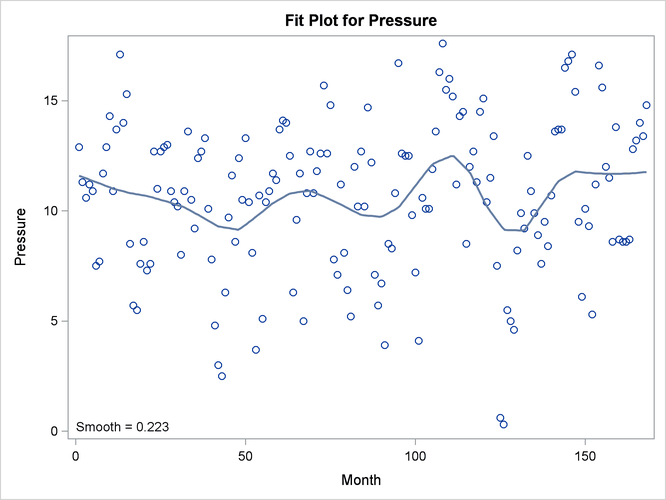 The “Smoothing Criterion” and “Fit Summary” tables are shown in Output 53.4.2, and the fit plot is shown in Output 53.4.3. This weather-related data should exhibit an annual cycle. However, the loess fit in Output 53.4.3 indicates a longer cycle but no annual cycle. This suggests that the loess fit is oversmoothed. One way to detect oversmoothing is to look for patterns in the fit residuals. 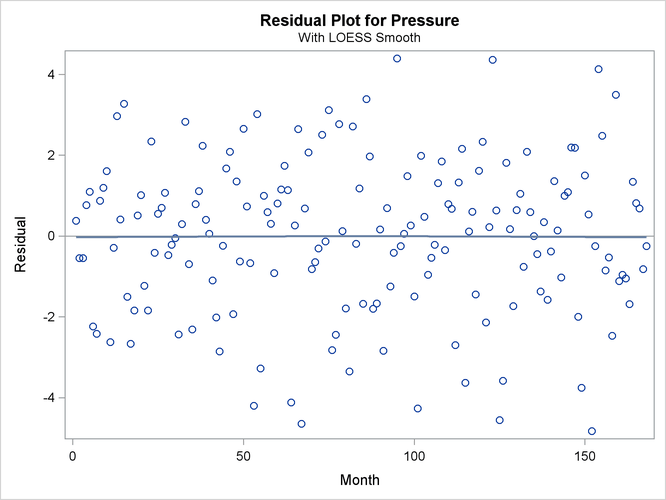 With ODS Graphics enabled, PROC LOESS produces a scatter plot of the residuals versus each regressor in the model. 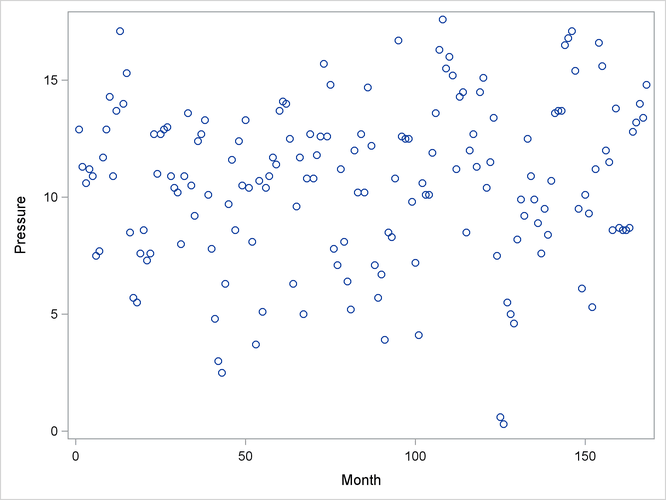 To aid in visually detecting patterns in these scatter plots, it is useful to superimpose a nonparametric fit on these scatter plots. You can request this by specifying the SMOOTH suboption of the PLOTS=RESIDUALS option in the PROC LOESS statement. The nonparametric fit that is produced is again a loess fit that is produced independently of the loess fit used to obtain these residuals. With the superimposed loess fit shown in Output 53.4.4, you can clearly identify an annual cycle in the residuals, which confirms that the loess fit for the ENSO is oversmoothed. What accounts for this poor fit? Output 53.4.6 shows that with the restricted range of smoothing parameter values examined, PROC LOESS finds the global minimum of the AICC criterion. 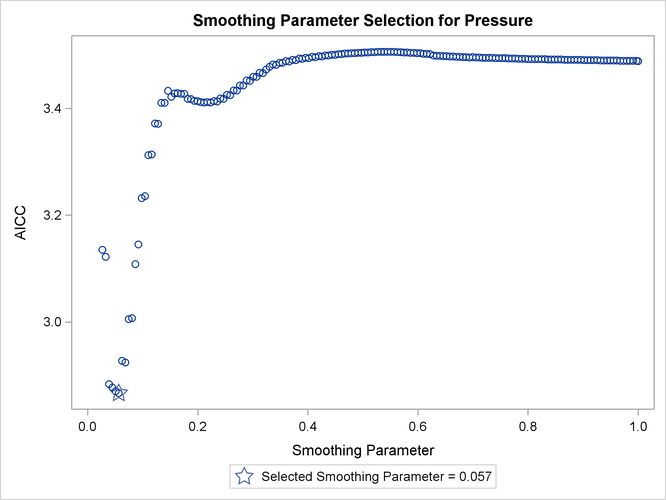 Often you might not know an appropriate range of smoothing parameter values to examine. In such cases, you can use the PRESEARCH suboption of the SELECT= option in the MODEL statement. When you specify this option, PROC LOESS does a preliminary search to try to locate a smoothing parameter value range that contains just the first local minimum of the criterion being used for the selection. The following statements provide an example. Output 53.4.7 shows that with the PRESEARCH suboption specified, PROC LOESS selects the smoothing parameter value that yields the global minimum of the AICC criterion. 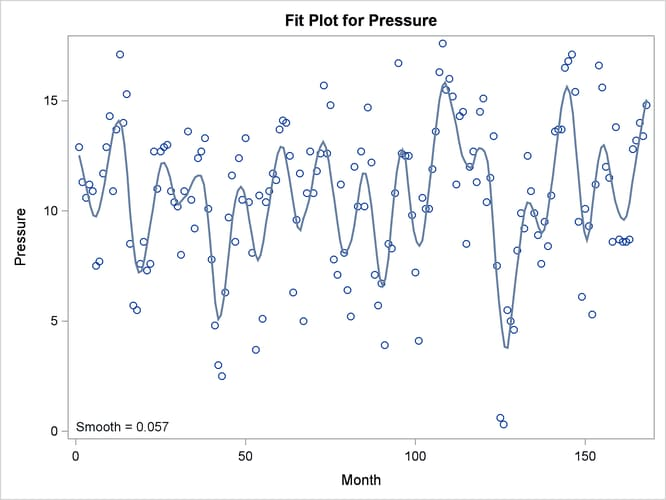 The fit obtained is shown in Output 53.4.8, and a plot of the residuals with a superimposed loess fit is shown in Output 53.4.9. 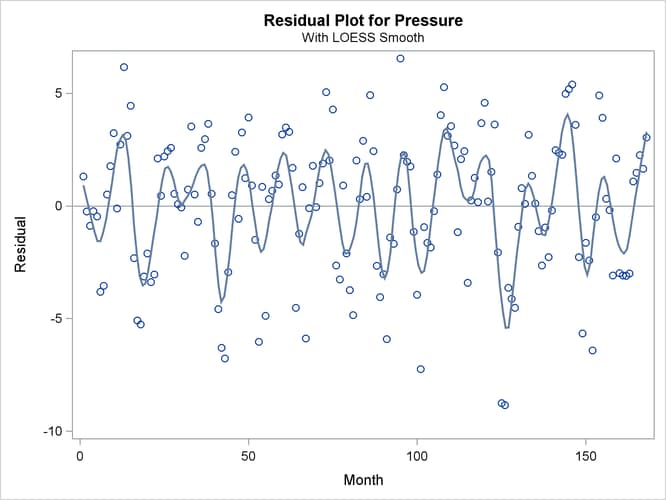 In contrast to the residual plot show in Output 53.4.4, the residuals plotted in Output 53.4.9 do not exhibit any pattern, indicating that the corresponding loess fit has captured all the systematic variation in the data.